Cameroon is a Central African country located on the Gulf of Guinea. Through its history of British and French colonialism, most people speak English or French, though more than 100 other dialects are spoken as well. It has one of the stronger economies in sub-Saharan Africa, but its people continue to face problems like corruption, unequal wealth distribution, and a lack of adequate infrastructure. Traditional arts and crafts are practiced throughout the country; the high-quality clay of the Western Highlands is particularly well suited to pottery. Prescraft is dedicated to preserving the rich cultural heritage of Cameroon in West Africa. 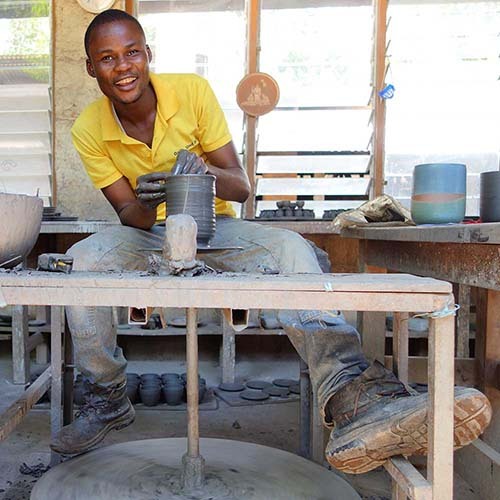 Prescraft has enabled hundreds of disadvantaged handicraft producers to sell their products within the fair trade market and become self-reliant.